By keeping the track of the latest market trends, we are engaged in manufacturing, exporting and supplying an exclusive range of Four Way Glass Spider Fitting. To accomplish the numerous requirements of the clients, we are engaged in providing a high quality range of Glass Spider Fitting. • Spiders are offered in excellent brush as well as mirror polished finishes. 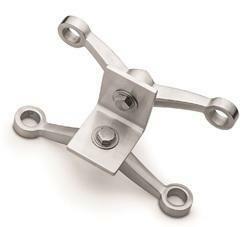 • Higher weight at higher loaded area enable these spider to be used in heavy duty applications. We are offering Spider Fitting to our clients. With the assistance of our team of professionals, we tend to provide a large vary of Glass Spider Fitting. The offered Glass Spider Fitting is widely used across producing, engineering, and connected industries for fitting glasses.